The StarBoard Interactive LCD Displays offer the functionality of our large-format electronic whiteboard in a convenient interactive LCD panel. Connected to your PC and a projector, the Interactive LCD Display lets you run and annotate any computer software application without loosing eye contact with your audience. The panel image, which remains clearly visible even in darkened environments, can be projected up to any size which renders it ideal for lecture halls or large auditoriums.he StarBoard T-15XL provides a very attractive user paradigm. Presenters face their audiences or classrooms when using the display device with the image projected onto any size screen depending on the format of the meeting room or classroom. Unlike interactive whiteboards, the presenter is not blocking the audience's view as they annotate images or run applications, and presenters do not need to stare into glaring LCD projectors or turn their backs to their audiences to markup and bring color and life to their material. The bright 15" display with XGA resolution provides a very clear image on which to work and provides pinpoint accuracy in running applications and adding comments and annotations to presentations. Hitachi Interactive LCD Display features a thin screen that eliminates glare and parallax error, assuring effortless, accurate operation. Electromagnetic interactive technology delivers fast, responsive precision tracking. A wireless programmable grip stylus supports complete mouse emulation, with left and right clicks and single-click transitions between standard PC operations (mouse mode) and screen annotation (pen mode). The complete StarBoard software suite is included. 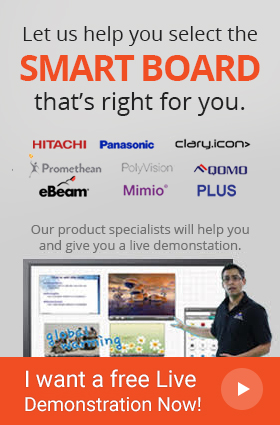 The StarBoard T-15XL is the latest interactive system from Hitachi for annotating presentations and running computer based applications in meetings, classrooms, videoconferences, trade shows and symposiums. The StarBoard T-15XL is a pen-driven 15" TFT display that allows users to operate or annotate any software application running on a connected computer. The annotated images can be viewed on other displays connected to the computer including LCD projected images. Similarly the display can be viewed on any other StarBoard interactive display either in the same location, or connected through a LAN or WAN connection. The appeal of the StarBoard T-15XL is enhanced by the intuitive, easy-to-master StarBoard Software that allows anyone to be proficient in a matter of minutes. The pen-driven, icon oriented user interface allows users to move from running applications to annotating them with a single click operation.